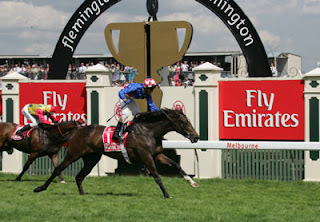 Otherwise known as the Melbourne Cup, is run today! And because of that, lots of people in Melbourne get the day off. 100, 000 or so will head off to Flemington to watch the horses run, but for the rest of us, it is just a day off! If I remember, I will either watch or listen to the race, although I completely missed it last year! For many people, this is the one race of the year that they will have a bet on, but I don't think I will even be doing that this year. What will I be doing instead? Hopefully relaxing. I have spent the last two days playing tour guide around Melbourne, and I need to recover now!